The Cobblers will kick off the new Sky Bet League Two season with a home clash with Lincoln City on Saturday, August 4. The fixtures for the new campaign have been released, and in a hectic opening spell, Town will play at least six games in the opening four weeks, with four of those on the road. The long trip to Carlisle United (Aug 11) follows the opening day date with the Red Imps, who were beaten in the league two play-off semi-finals last month, and the Cobblers then travel to Wycombe Wanderers for a midweek Carabao Cup first round date, before Cambridge United visit the PTS Academy Stadium on August 18. A Tuesday night trip to Morecambe follows on August 21, before Town go to Colchester United on August 25. September starts with two home dates in a row, against newly-promoted Tranmere Rovers (Sep 1) and Gary Johnson’s Cheltenham Town (Sep 8), before Town go to Port Vale (Sept 15), host Notts County (Sept 22) and make the trip to Mansfield Town (Sept 29). The festive fixtures have been relatively kind to Dean Austin’s men, with a trip to Yeovil Town on December 22 followed by two big home fixtures, against Swindon Town on Boxing Day (Dec 26) and Milton Keynes Dons the following Saturday (Dec 29). New Year’s Day sees the Cobblers make their first Football League trip to Forest Green Rovers. Other fixtures of note include the trip to Stadium MK to take on Paul Tisdale’s Milton Keynes Dons on Saturday, October 20, the short trip to the Abbey Stadium to play Cambridge United will be on Saturday, January 19, and Town go to Notts County on Saturday, April 6. Over Easter, Town are scheduled to host Macclesfield Town on Good Friday (April 19), before an Easter Monday trip to Bury (April 22). 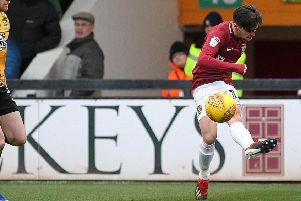 The Cobblers wrap up their campaign, just as they did last season, with a clash against Oldham Athletic – although this time the match will be at Boundary Park.